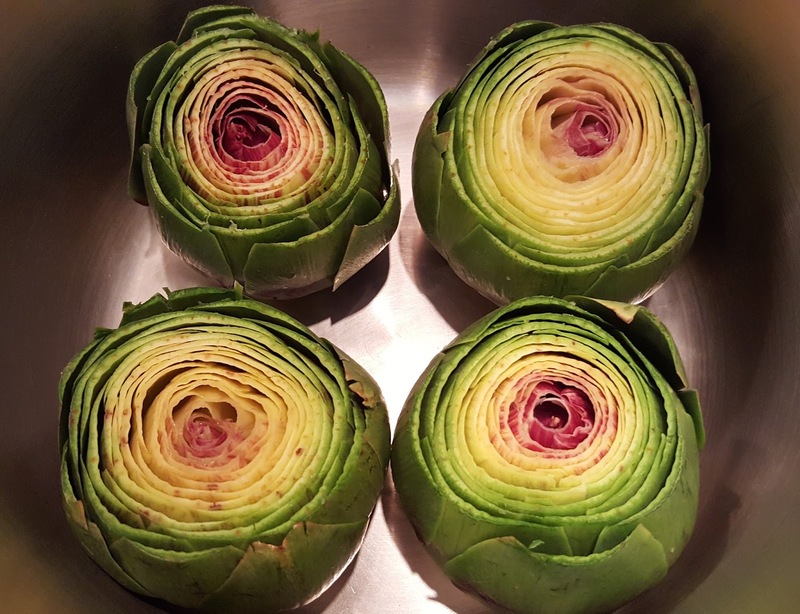 The smaller the artichoke, the shorter the time in the pressure cooker. I don't like to use artichokes much smaller than 10 to 12 oz because trimming them takes so long that I'd rather do just one big one per person. Large artichokes can be carefully cut in half vertically after they have cooled, and the chokes scraped out with a table knife or spoon. That way, 4 artichokes can serve 8 people. Wash the lemon, halve it, and put it aside. Remove the stems from each artichoke immediately below the outermost leaves, making a flat surface for each one to stand on. 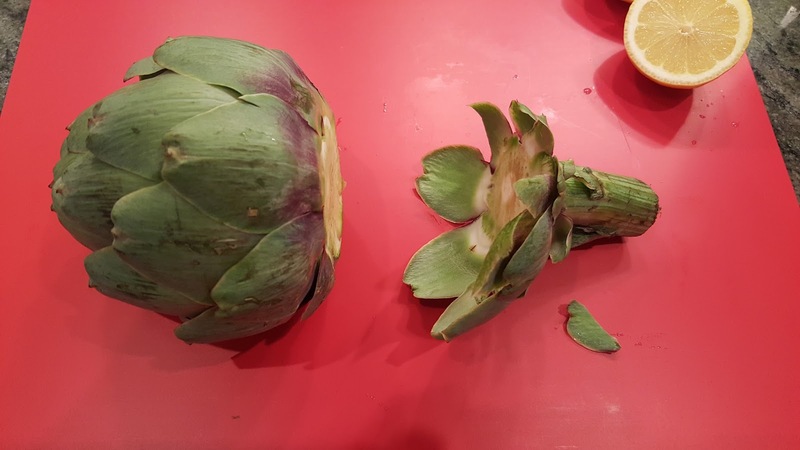 Pull or cut off all of the outer leaves that are less than three-quarters the height of the artichoke, and trim the base of their stubs. Rub the cut surfaces with one piece of the cut lemon. Turn each artichoke on its side and cut off the top one-quarter of the artichoke. Using kitchen shears, cut off the thorny tops of any leaves that escaped the cut. Rub the cut surfaces with the same piece of lemon. 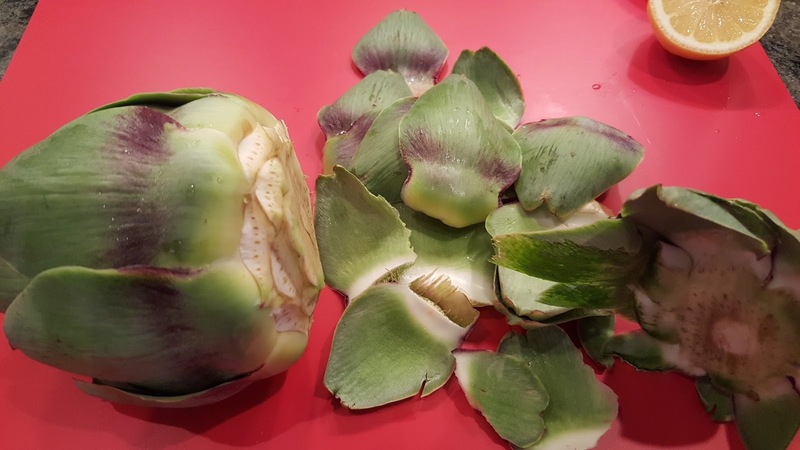 With your thumbs, pull all of the leaves outward from the center of the artichoke so that there is space between the layers. Inspect for and remove any insects or dirt that may be there. Stand the artichokes in the bottom of the pressure cooker. Squeeze the juice out of both pieces of lemon, and cut the skin into 4 pieces. 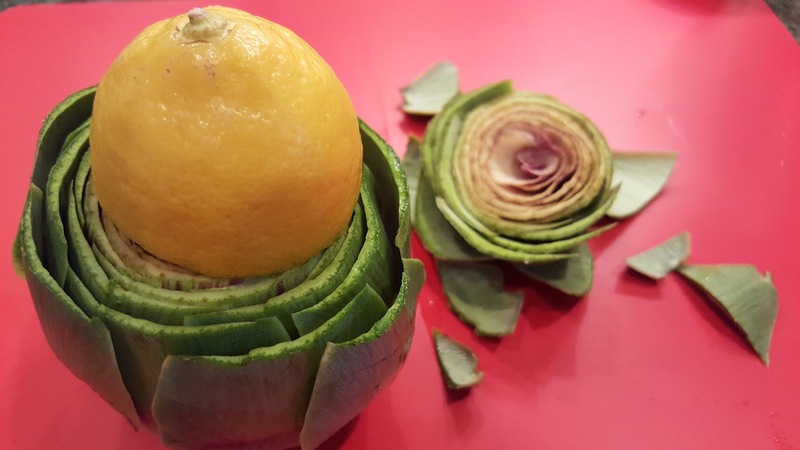 Drizzle the lemon juice evenly into the artichokes, and place the lemon peels around the bottom of the pressure cooker. Sprinkle one-quarter of the powdered garlic over each artichoke. Sprinkle one-quarter of the salt over each artichoke. Drizzle 7 ml (or ½ tablespoon) of balsamic vinegar into each artichoke and pour the remainder into the center of the pressure cooker. Drizzle 20 ml (or 1½ tablespoon) of olive oil into each artichoke and pour the remainder into the center of the pressure cooker. Peel the garlic cloves and distribute them around the bottom of the pressure cooker. Place a few bay leaves in the bottom of the pressure cooker. Pour 240 ml (or 1 cup) of water into and around the artichokes in the pressure cooker. 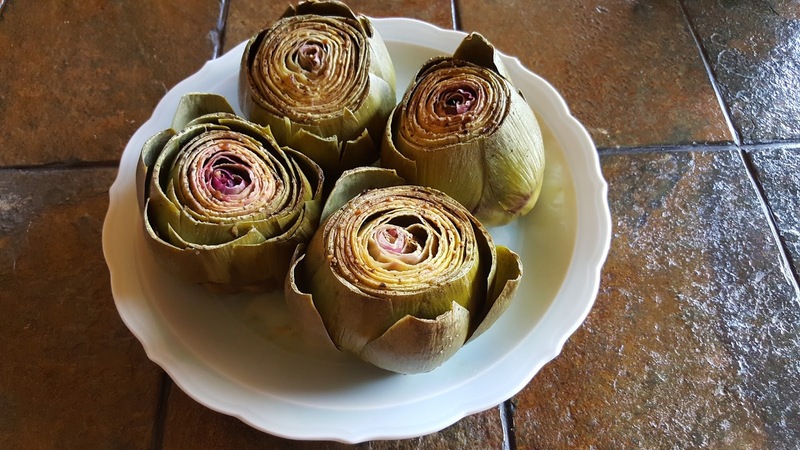 Place the lid on the pressure cooker and, following the manufacturer's instructions, cook the artichokes at high pressure (100 kPa, or 15 psi) for 13 minutes, then use the recommended method to reduce the pressure as quickly as possible. Remove the artichokes to a serving platter and, if necessary, boil down the liquid in the bottom of the pressure cooker. 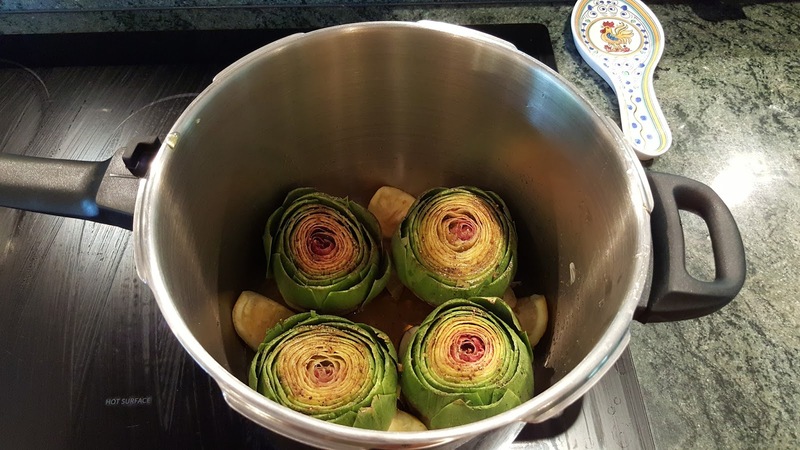 Cool the liquid, strain it, and either pour it over the cooked artichokes or serve it on the side. Provide empty bowls on the table for the inedible undersides of the leaves and the aptly named chokes. I ate my first steamed artichoke in my mid-twenties, at a friend's house in San Francisco. I was fascinated by the ritual of tearing off one leaf at a time, dipping in mayonnaise, raking the soft meat off with my teeth, working it down to the choke, shelling out the choke with a knife, and finally reaching the toothsome heart. I liked everything, even the mayonnaise. When I started cooking them myself, I wanted to add condiments during the steaming process, and for years half-boiled, half-steamed them in lemony water with some oil added. 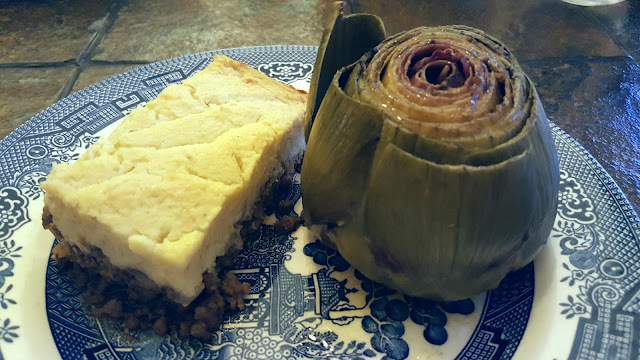 This transferred wonderfully to a pressure cooker method, because minimal water is necessary for the cooking, and flavors—of course I added more—are more easily absorbed by the vegetable.